Netanyahu issues warning to Syria and Iran at the start of his meeting with the President of Ukraine. 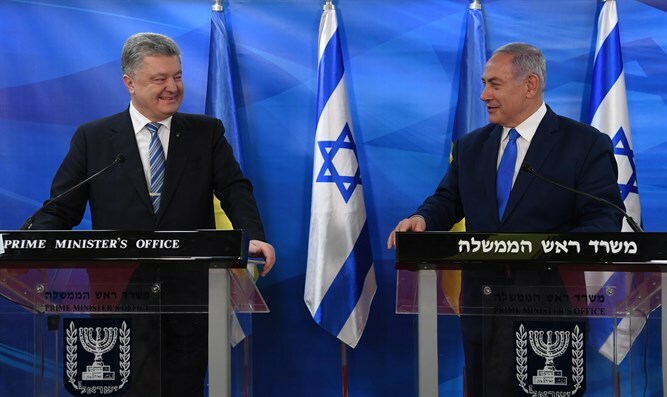 Prime Minister Binyamin Netanyahu on Monday evening met at the Prime Minister's Office in Jerusalem with Ukrainian President Petro Poroshenko. “During your first official visit to Israel, you addressed the Knesset. And in this wonderful speech, you said something. You quoted a Ukrainian citizen in the airport going to Israel. He said, 'Is this a domestic or an international flight?' Kiev-Tel Aviv. And I think that it’s not merely that flights between our two respective countries are frequent and full, but it’s also a reflection of the full relations between the Jewish community in Ukraine, and the Ukrainian Jews who made Aliyah to Israel who have become an integral part of our society. I’m also very happy that these flights are filled with businessmen and businesswomen, entrepreneurs, people who seek to expand the investments and the trade between our countries,” added Netanyahu.